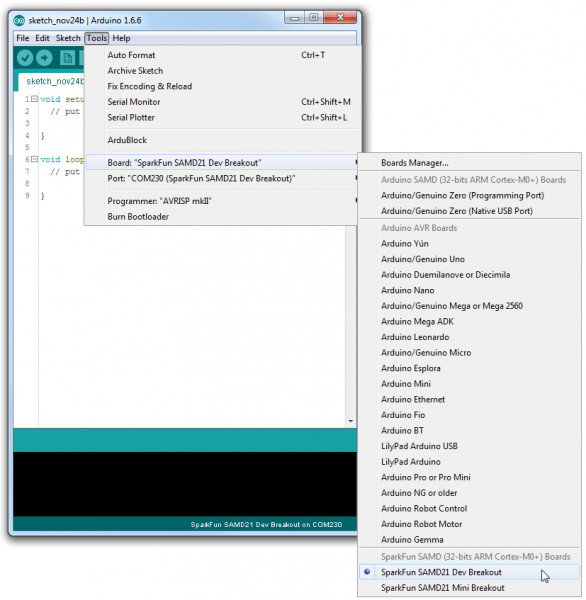 While the SAMD21 alone is powerful enough, what truly makes it special is its growing support in the Arduino IDE. 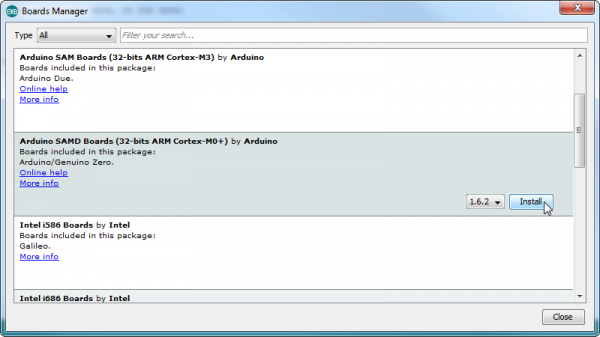 With just a couple click's, copies, and pastes, you can add ARM Cortex-M0+-support to your Arduino IDE. 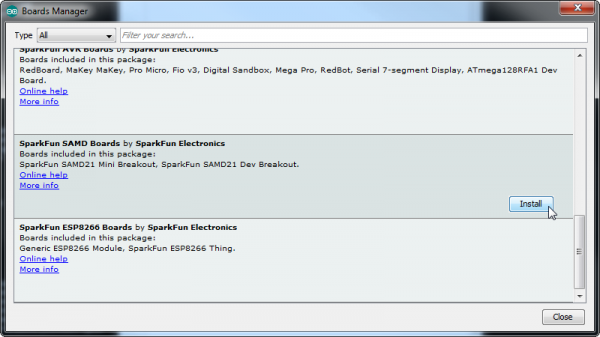 This page will list every step required for getting SparkFun SAMD21 Breakout support into your Arduino IDE. Update Arduino! This setup requires at least Arduino version 1.6.4 or later. We've tested it on 1.6.5 and the latest version – 1.6.6. 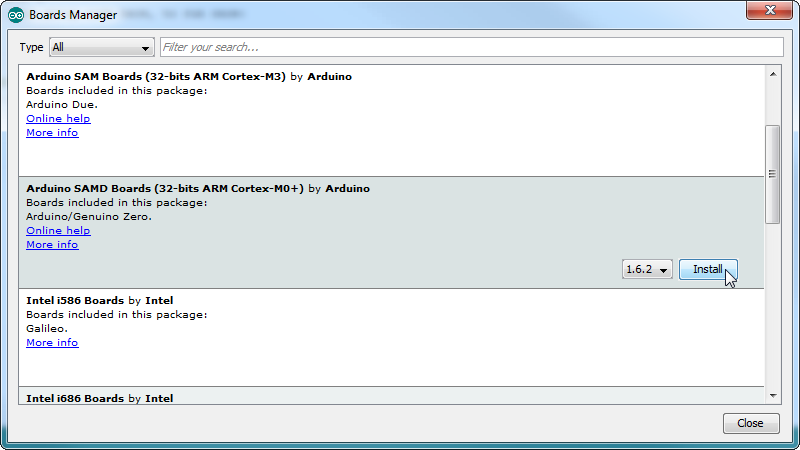 If you're running an older version of Arduino, consider visiting arduino.cc to get the latest, greatest release. First, you'll need to install a variety of tools, including low-level ARM Cortex libraries full of generic code, arm-gcc to compile your code, and bossa to upload over the bootloader. These tools come packaged along with Arduino's SAMD board definitions for the Arduino Zero. To install the Arduino SAMD board definitions, navigate to your board manager (Tools > Board > Boards Manager...), then find an entry for Arduino SAMD Boards (32-bits ARM Cortex-M0+). Select it, and install the latest version (recently updated to 1.6.5). Downloading and installing the tools may take a couple minutes -- arm-gcc in particular will take the longest, it's about 250MB unpacked. 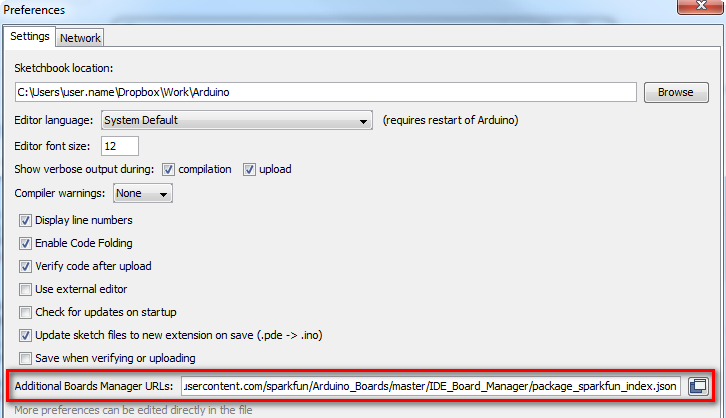 Once installed, Arduino-blue "Installed" text should appear next to the SAMD boards list entry. Then hit "OK", and travel back to the Board Manager menu. You should (but probably won't) be able to find a new entry for SparkFun SAMD Boards. If you don't see it, close the board manager and open it again. ¯\_(ツ)_/¯. This installation should be much faster; you've already done the heavy lifting in the previous section. Once the board is installed, you should see two new entries in your Tools > Board list: one for the Mini Breakout and one for the Dev. Select your SparkFun SAMD21 Board. Finally, select your SAMD21 Board's port. Navigate back up to the Tool > Port menu. The port menu may magically know which of your ports (if you have more than one) are the SAMD21 board. On a Windows machine, the serial port should come in the form of "COM#". On a Mac or Linux machine, the port will look like "/dev/cu.usbmodem####". Once you find it, select it!